In December 2018, Health Innovation Network became the first AHSN to commit to the #EquallyWellUK charter. With more than 100 organisations already signed up, including NHS England and Public Health England, the charter is one of three initiatives that seeks to promote and support collaborative action to improve physical health among people with a mental illness by signing individual organisational pledges. 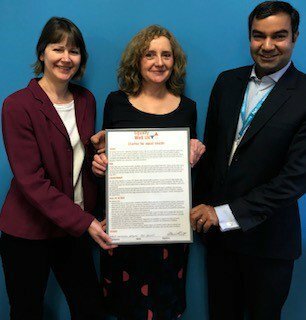 Pictured above L-R: acting CEO, Zoe Lelliott; Head of Mental Health, Aileen Jackson; and Clinical Director for Mental Health, Dr Muj Husain. For Health Innovation Network, signing this charter means that all our clinical themes have committed to ensuring that their work improves outcomes for all, including those with mental illness. A great example of a project that already does this is our work in improving the detection of Atrial Fibrillation in people with serious mental illness that you can read about here. We are also committed to introducing providers and commissioners to promising digital solutions, and evaluating their impact. Read more about our Mental Health theme here and about the pledge here.